Group Discussion Ideas > General GD Topics > Aadhaar-Mobile linking – Good or Bad? Aadhaar-Mobile linking – Good or Bad? The government is looking for simplification these days. To make traceability easier, the government now wants to link citizens’ SIM cards with their Aadhaar cards. According to the orders issued by the UIDAI and the mobile companies, all the mobile phone subscribers are requested to mandatorily link their SIM cards with their Aadhaar Number by 6th February 2018. Aadhaar serves as an identity and address proof. The objective of linking SIM with Aadhaar Card is to remove the illegal users and to decrease the misuse of mobile phones for anti-social activities. The another motive of linking Aadhaar to mobile is to promote the usage of Aadhaar as the sole proof of identity throughout the country. 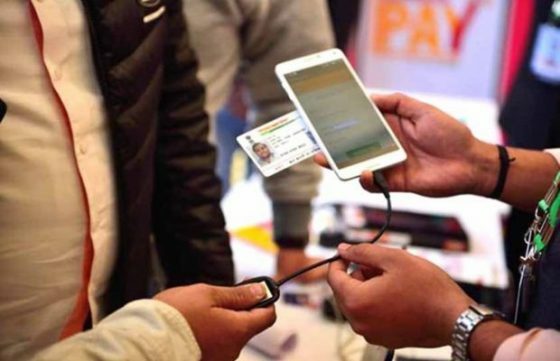 Since a mobile phone is of the few things that almost every person is dependent on, it is natural for the government to stress on its linkage to Aadhaar to increase the rate of Aadhaar adoption. The 12-digit unique identification number, Aadhaar, serves to eliminate the duplicate “persons” in the demographics. This serves to create specificity in the targeting of the needy in various government schemes. For example, it will be easier to target the needy and remove the duplicates in the distribution of grains from the Fair Price Shops. According to Nandan Nilekani, the creator of the Aadhaar, it is not only going to benefit the govt. sectors but private sectors as well, as with the Aadhaar backed identity will help both sectors to know who they are dealing with. Aadhaar is secure, as the data collected by the UIDAI is highly encrypted to prevent leakage and UIDAI does not share any information with anyone under general circumstances. The data is shared only by the government in some way verifies the request of a requestor. Thus, making it more secure. According to the statement issued by UIDAI, mobile users will now have three more options to link their mobile numbers to Aadhaar, which can be done at the doorsteps. Hence, easing the process. As to the arguments that Aadhaar linking to various services interferes with a person’s privacy, the government states that a person should have the right to sacrifice his right to privacy for his own greater good. It directly attacks the right to privacy, which is a fundamental right of every citizen, protected under the Article 21 of the Constitution of India. Aadhaar stores three kinds of information: biometric (the photo, fingerprint and iris scans), identity (the biometric plus the demographic info such as the person’s location, date of birth, etc.) and personal (all other info about a person such as his shopping habits mobile phone records, political inclinations, etc.). The Act safeguards first two but the third is not mentioned. This creates a vacuum for the government to play in. For example, if Aadhaar is made mandatory for railway tickets as well, the government can harness your phone records from the mobile companies and compare them with your travels. Such a condition makes way for a dangerous “mass surveillance” which is symptomatic of totalitarian governments. It may enable terrorists, criminals, and anti-national forces to obtain multiple SIMs through eKYC, claims of eKYC, or submitting Aadhaar cards of other persons and use them for anti-national activities. Not only will you have no way to know of such misuse, but you even have no ability to prove and control the misuse. There have already been leaks from the data of CIDR (Central Identities Data Repository), where all the data from Aadhaar is stored. Furthermore, the data provided to various corporates has also been misused to some extent. The main danger is that instead of hacking the CIDR directly, hackers may hack the security network of other computers which have been granted permission to use the data. The argument that a person can sacrifice his or her fundamental rights to gain access to “greater good” has two innate problems. Firstly, it tends to differentiate between the rich and the poor because it is generally the poor who need access to government schemes for livelihood; secondly, the government has the dual responsibility of providing social security as well as safeguarding the fundamental rights of the people – it cannot simply withdraw from one of these duties to perform the other. Since everybody has SIM Card and sometimes more than two, the government feels tracking the SIM will be a strong verification factor. Just like the PAN card helps the Income Tax department in tracking and tracing the transaction details, in the same way, Aadhaar will be used to trace the social life of a person. These kind of social identity numbers are common in other developed countries. However one of the biggest threats is confidential data storage and security. The leakage of data is a major issue with this. The government will have to set up a wing just to safeguard the data and to provide security. Apart, from all these problems Aadhaar-Mobile linking can be a good step towards development of the nation. Photo Credits :- BMN Network via Flickr under CC 2.0.